A Magical Experience with The Perfect Christmas Roast! Christmas is my favorite time of the year! It’s also a time to gather with family and friends and enjoy a time of merriment to create wonderful memories. For a merry gastronomic journey, Hilton Petaling Jaya is presenting A Magical Experience with The Perfect Christmas Roast this festive holiday. Paya Serai, a favorite hotspot for buffets will showcase Hilton Petaling Jaya Master Chefs’ irresistible yuletide indulgences. Highlights of The Perfect Christmas Roast includes the holiday season’s favorite Roasted Tom Turkey with Chestunut & Sage Stuffings, Garlic Marinated Roasted Leg of Lamb, Roasted Venision with Yorkshire Pudding served with Giblet Gravy, Cramberry-Orange Compote, Beet Chutney and Cranberry-Mustard Relish. Such a lavish carvery station filled with beautifully roasted and succulent meats, it was a treat as the turkey, lamb and venison was simply scrumptious and perfect for the holiday indulgence. There are plenty of sides to accompany the meats and the only challenge here is having enough tummy space to try all the dishes! Some of the side dishes available are Buttered Brussel Sprout with Glazed Carrots, Green Asparagus and Button Mushroom, Baked Potato with Broccoli Cream Cheese, Sautéed Mix Vegetables, Corn on Cob and more. Available on Christmas Eve and Christmas Day, the Magical Christmas buffet also has lots of other treats from our melting-pot of cuisines and international ones too. From barbecue dishes from all over the world, there are also a kaleidoscope of Smoked Salmon, Sea Salt & Brown Sugar Marinated Salmon Fillet, Grilled Veal with Mushroom Ragout and Percik Sauce, Turkey Steak with Grilled Peaches & Pineapple, Oven Baked Chicken Cordon Bleu, Chicken Quenelle, Broiled Salmon on Soba & Teriyaki Sauce, Beef Roulade with Walnut Parsley and more. Japanese cuisine is always a crowd pleaser, so the holiday buffet will also include a selection of Japanese sushi and sashimi as well as lots of cooked dishes such as tempura and teriyaki on their live stations. Seafood lovers will also enjoy the spread of Seafood on Ice with tempting treats of Fresh Oysters, Prawns, Mussels and more. For the ‘Love of Shuck’, there will also be freshly shucked oysters with cucumber jelly, tomato shooters and green papaya relish. Enjoy the live stations all ready to whip up a-la minute delights and freshly prepared pastas. Though it may be difficult to limit one to the luscious savory spread, don’t forget as there is a host of Christmas sweets tempting one’s sweet tooth. From the majestic and gorgeous French Croquembouche to the heavenly Christmas Yule Log, Assorted French Pastries, Miniature Fruit Savarin with Ginger, Tiramisu & Blueberries Chantility, Miniature Festive Cup Cake, Cinnamon Almond Chocolate Cake, Poached Pear with Ginger Bread Spice, Minced Pies, Christmas Fruit Cake, Apple and Pineapple Crumble, Bread and Butter Pudding and more. To get into the spirit of Christmas and the joyous moments, there is an Advent calendar complete with Christmas socks to countdown and celebrate the days in anticipation of Christmas. Diners who spend RM250nett in a single receipt would win daily mystery gifts which consists of dining vouchers, Christmas treats and goodies! There are also many other Christmas Goodies and promotions available at Hilton Petaling Jaya. 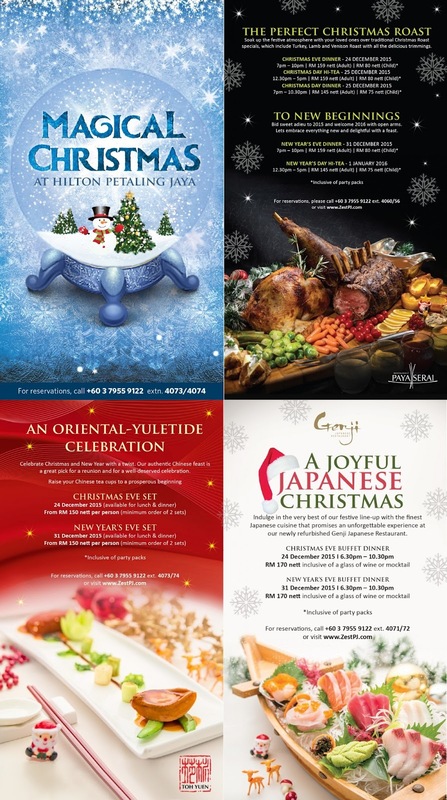 Bring home Christmas treats from Relish Hilton’s Christmas Goodies @ Caffe Cino or check out Christmas menus available at Genji Japanese Restaurant as well as Toh Yuen Chinese Restaurant. Visit their F&B blog at www.ZestPJ.com for the latest F&B promotions.